Have you already had a tasty menu in mind for your dinner menu today? Well, why not trying to cook Chicken Parmesan? This recipe is simple and it only takes 40 minutes for you to complete it. Plus, you will really love the yummy taste of the recipe. Preparing the Chicken Parmesan menu is not complicated. The materials and ingredients needed are easy to get. You can even find them easily around your house. So, these are what you need to cook the meal. 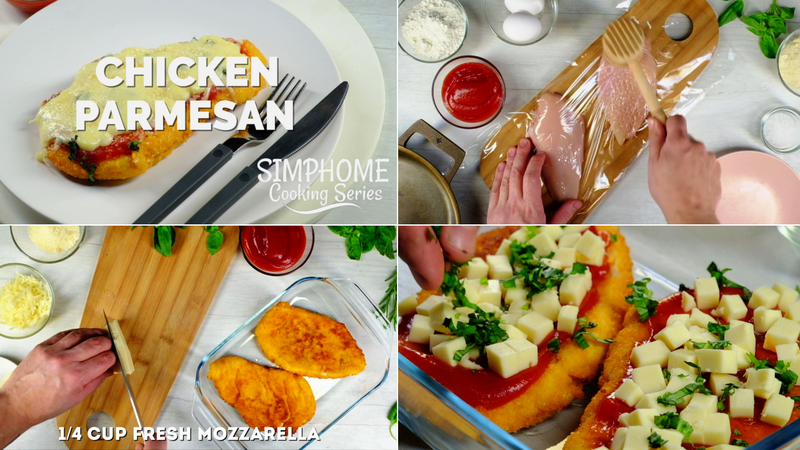 After you have prepared all materials and ingredients needed to make the Chicken Parmesan recipe, now it is time to cook the dish. Read carefully of what you need to do. 1. Prepare the chicken breast halves and put them on a chopping board. To make the meats tender, you can use a dough grinder. Beat the chicken breast halves up by using the grinder. Prepare a piece of transparent plastic to cover meats and keep them clean. Leave the meat for 5 minutes. 2. Prepare a bowl. Then, crack the two eggs and put them on the bowl and stir thoroughly. 3. Put the cover of the meat up and then add salt to taste. 4. Pour freshly ground black pepper on the meat to add taste. 5. Prepare 1 cup of panko bread crumbs and ½ cup of grated Parmesan cheese in a bowl and mix them. Use your hand to make sure that the mixture can blend well. 6. The next thing you should do is pouring 2 tablespoons all-purpose flour on the meats and leave them for a while. 7. Put the meat that has been poured with all-purpose flour in the stirred eggs and then dipped them. After that, take the meats out and then put them in the mixture of panko bread crumbs and grated Parmesan cheese. Make sure that the two sides of the meat are covered by the mixture and then set them aside on a plate. 8. Prepare a frying pan and pour 1 cup of olive oil it. Heat the pan and then fry the meats till their color turn golden brown. 9. Take the meats away and put them on a dish. 10. Chop ¼ cup of fresh mozzarella into dices along with the fresh basil. Set them aside. 11. The next thing you should do is pouring ½ cup prepared tomato sauce on the meat, add the diced mozzarella cheese and fresh basil. 12. To add the taste, add ½ cup grated provolone and ¼ grated Parmesan cheese on top. 13. For the last step, bake the chicken for 15 to 20 minutes at 450F. Your tasty chicken Parmesan is ready to serve.